The heart is a pumping organ that receives blood from veins and pumps it into the arteries it is made up of cardiac muscles. It is situated in thoracic cavity which lies above the diaphragm between the two lungs. It is enclosed in a double-walled membranous the pericardium. Chamber of The Heart : The interior of the heart is divided into four chambers which receive the circulatory blood . The Auricles : The two superior chamber are called the right and left auricles. The auricles are separated by a partition called the inter-atrial septum. The sinuatrial node (SAN) or the pacemaker is located in the upper wall of the Right atrium. The Ventricles : The two interior chambers of heart are the right and left ventricles. They are separated from each other by an inter-ventricular septum. The Atrio-Venticular Valves : These valves separated the atria from the ventricles the right side of the heart possesses the tricuspid valve and left side of the heart possesses the bicuspid valve or mitral valves are needed to avoid backward flow of blood in the chambers of the heat. 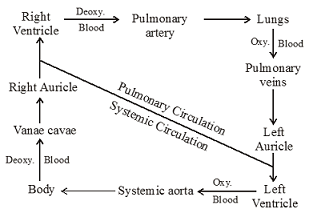 Semilunar Valves : These are located in the arteries leaving the heart.